History is shaped by people, their surroundings and the events that take place within. In the study and recording of the history of an area and the analysis of the lifestyles of its past inhabitants researchers often have to turn to surviving physical evidence and oral histories to help paint a picture of what life may have been like. Most often, the only enduring evidence is the architecture which may outlive any paper documentation or human recollection. The structures that were built reflect the needs, aspirations, beliefs and values of those who inhabited them and other social, economic, and climatic factors of the time. 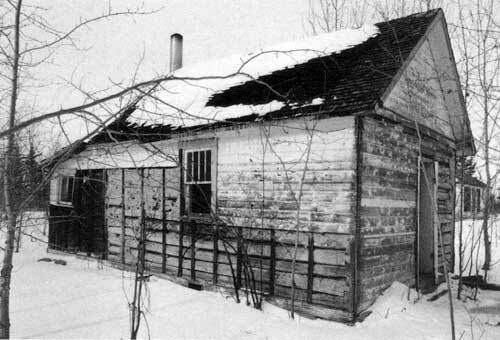 Rural Manitoba holds a wealth of examples of early architecture dating back to the first settling of certain areas at the turn of the century. Many of these “forgotten treasures” lie abandoned along rural roadsides or are used as granaries or storage outbuildings in farmyards, slowly deteriorating over time. 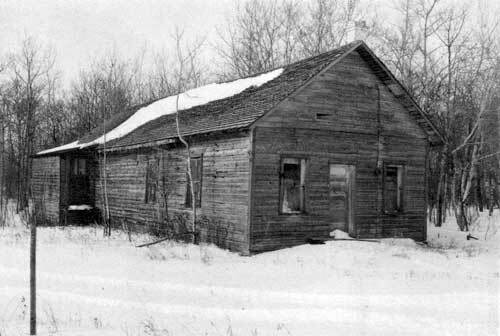 Records of first settlement in many smaller rural districts in Manitoba are hard to find if they exist at all, and often one’s only direct source of information lies within the surviving inhabitants alone or in stories of “the old days” passed on from generation to generation. Sadly, as time passes even this information is harder to obtain as time slowly erases itself, as people pass on and buildings fall. One hundred years ago, in 1899, the first settlers of what was to be later known as the Cork Cliff District (an area located near the southern tip of Lake Winnipegosis) immigrated to Canada from their native villages of Vikno and Lezaniwka in Western Ukraine. They left their beloved, but oppressed, homeland filled with the hopes and dreams that came with the promise of land and freedom in the “new country”. Among them was my great grandfather, Onufrey Lytwyn, then only sixteen. At the time the Lake Manitoba Railway and Canal Company line was extended from Sifton, Manitoba to a small settlement called Gruber. It was here that these Ukrainian immigrants ended their long journey, very much alone in a new land with little money, few earthly possessions and speaking no English. However, their strong faith in God and the fierce determination to build a new life for themselves and their families gave them the courage to face the elements, hardships and prejudices that lay ahead. The Church of the Nativity of the Blessed Virgin Mary, or “the Little Farm Church” and cemetery. As dictated by tradition in Western Ukraine, the church was built on what was considered to be the highest point of land in the area, a ridge that lay in a somewhat central position of the settlement. With no existing models to guide their construction, these first settlers based the design of the church on memories of their native village churches. Adaptations were made to suit economic limitations and a harsher climate which restricted the amount of time available for building. 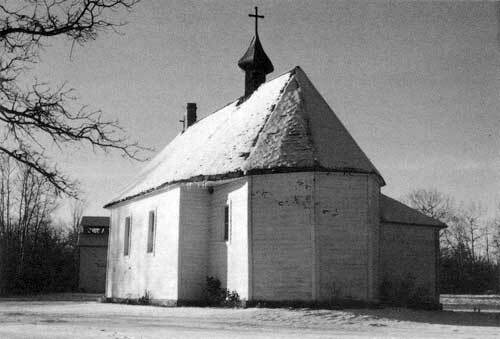 The building of “the Little Farm Church” was the product of the combined effort of the Ukrainian and Polish settlers of the area led by a builder named Peter Szmidt. The land, as well as many of the religious artifacts, were donated by the settlers themselves. The building of the church was not an easy task. The timber was cut from a point approximately eight miles away and hauled by oxen or by hand across sloughs. When a bell tower was later built on the site, the small community raised money by caroling over a period of several years to fund the ordering of a bell from Germany, one of six shipped to Canada in 1910-11. This same bell still tolls and can be heard for miles around. In plan the church is a simple rectangle with a five sided apse at the east end. This shape, representing the form of a ship is an early Christian symbol representative of the temptations and tribulations a traveler (or believer) must undergo to reach their destination (or salvation). The building is of simple log construction with horizontal framing. A traditional Ukrainian onion dome (bania) and cross graces the gable roofline. Ornamentation on the exterior of the structure is also simple, but modest details such as the diamond pattern on the original doors and eave detail on the west facade give testimony to the fact that even with limited resources an effort was made to bring visual beauty to this simple form of architecture. The Church of the Nativity of the Blessed Virgin Mary (peak detail). The interior of the church is composed of a small choir loft, still held up by its original supports, the main body and an altar separated from the worship area by Royal Gates. However, the interior, as dictated by Ukrainian tradition, is highly decorated with paintings and other religious icons. Great care and skill was taken by craftsman Peter Kuzyk to carve the icon screen, altar, and benches. (Various artifacts were donated to the church by outsiders of the community such as a commemorative plate donated by the T. Eaton Company and a wood carving given to the congregation by a convict as a form of retribution.) It is a combination of all these details that make this church unique, telling the story of its congregation and others who valued it through its contents. The first service in the Church of the Nativity of the Blessed Virgin Mary was held on June 2, 1905, celebrated by Father N. Kryzanowskyj. It was on this day that my great grandfather Onufrey Lytwyn married my great grandmother Rose Suchey. There wasn’t a resident priest in those times but on Sundays everyone would still gather together to worship. When the priest did visit, usually around special holidays, he stayed most often with members of the congregation. A small, two room house was later erected on the church grounds as temporary lodging for the priest but was never used on a permanent basis. The Church of the Nativity of the Blessed Virgin Mary (rear view and bell tower). Onufrey Lytwyn, upon first arriving in the area, lived with relatives in a typical Ukrainian pioneer home. He was joined in 1901 by his father, Wasyl Lytwyn and three of his brothers. The rest of the family arrived later, all settling in the same area. At that time the land around Gruber was still being surveyed and divided into sections. Although he couldn’t speak their language Onufrey worked as a errand boy for these surveyors. Being one of the first to see the type of land available in the area he had an advantage when choosing a section for himself. His brothers also chose land close by. On land east of Gruber, Onufrey and his bride built their first homestead. Their second home, built in 1914 still stand today along with one of the two original barns and a few other outbuildings. This second home, now abandoned and in deteriorating condition, lies partially hidden in the trees that have since embraced it. It was constructed using square post and mud construction with dovetail joints and later covered in horizontal siding. The structure is one and half storeys high with a front porch and a gable roof finished with wood shingles. Details such as a carved eave at the peak of the gable act as a form of simple decoration. The structure as a whole can be read as “transitional” in style as it originally incorporated traditional Ukrainian planning integrated with adopted building materials and techniques. The plan of the house is reminiscent of a traditional Ukrainian layout with two large rooms on the lower floor. The “big room” (Velyka khata ) was for special use only, on holidays or for company. The “little room” (Mala Khata) was the family room for living and cooking. The second storey provided the bedrooms for the family. Later a shanty-like addition was built on the south side of the home that became the kitchen, making room for the parents’ bedroom on the main floor. A small shed like addition was also built onto the east side of the house. It was in this modest dwelling that Onufrey and Rose raised their family. Onufrey Lytwyn homestead built in 1914. Still standing on the property is a barn in considerably good condition although presently unused. 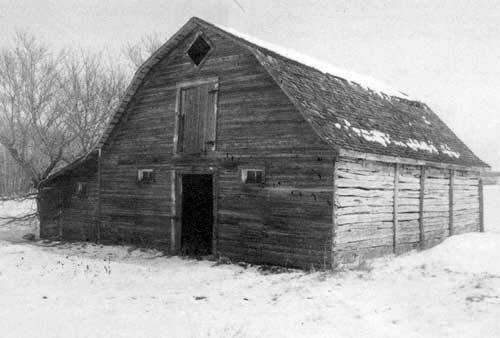 Built circa 1920 it was the second barn to be built and was used for sheltering horses, the first barn being built for cattle. Located on the southwest corner of the lot, the two storey structure is a simple rectangle in plan with east-west orientation. Resting on a stone footing it was constructed using square timbers held together with dovetail joints, the cracks between filled with mud and grass chinking to provide a warm, sound structure. The east and west facades are symmetrical and almost identical in appearance with a central door, two small side windows, a large loft door and a small diamond shaped window at the peak. Horizontal sideboard finishes these sides although the south side was left bare, exposing the log construction. The structure features a gambrel roofline often used in many Ukrainian barns built during the twenties as it was easier to construct and offered greater storage capacity than the gable or steep thatched roofs that were originally used. A lean-to addition was later built onto the north side of the structure using diagonal frame construction, and functioned as a calving pen or to house other smaller animals. It was a difficult life for these first Ukrainian settlers. They worked hard to clear the land and raise cattle and crops. When times were especially hard they fished on Lake Winnipegosis or took on other jobs to support their families. Much of the land was swamp or bush and at first supplies had to be hauled in from town by foot. Later, roads were built using horse-pulled or hand-held scrapers. However, through their hardships these settlers formed a close community always making time to attend church, to visit or to lend a helping hand whenever needed. The building of a community hall in the early twenties served as a gathering place for the settlement and further helped to enforce a sense of togetherness. Built by members of the community the Cork Cliff Community Hall was a place where dances, dramas box and pie socials, and puppet show were often held. For a short while it housed a small library and when the first school house burned down in the mid twenties classes were held there until a new school house could be constructed. It still stands today, this source of many happy memories for those who participated in the activities once held there. Onufrey Lytwyn homestead barn built circa 1920. Cork Cliff Community Hall built in the early 1920s. With the growth and increased stability of the Cork Cliff District came the need and time for education. 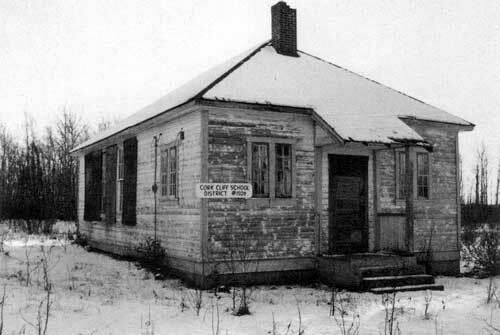 When the original school house burned down in 1926 a new one was quickly constructed at a new site approximately five miles south-east of the village of Winnipegosis, closer to the Cork Cliff Hall. 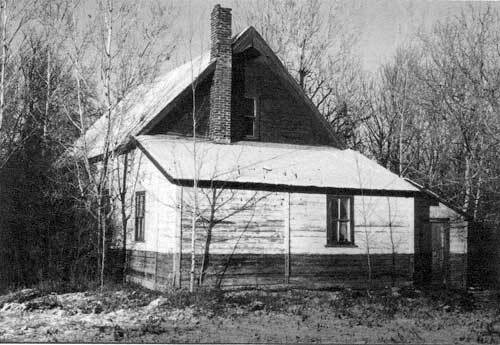 Built in 1926 by William Zwarich, the Cork Cliff School House, District #1509, still stands today, unused but in good condition. It was constructed in a style common for school houses built in the 1920’s one of numerous structures built in the area. It was used until 1967 after which students were bused into the nearby village of Winnipegosis to attend classes. Inside the school house there is a small entrance vestibule with a cloak room on either side. In earlier times these were segregated into girls’ and boys’ cloakrooms. The main body of the building is one large school room with chalk boards taking up the south and west walls. A stove to heat the building is centrally located in the rear. 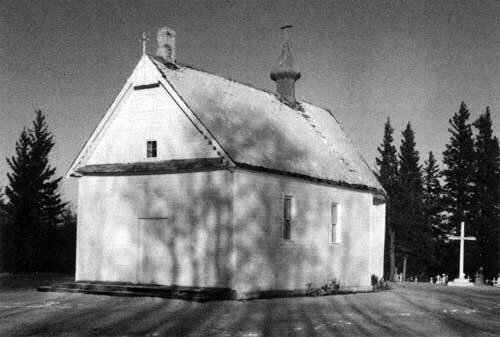 When used, the school house operated year round, teaching grades one to eight and during one year grade nine. Students sat by grade and were taught accordingly. The teacher lived year round on the site in a teacherage that still stands today, although in poor condition. Cork Cliff School House, Cork Cliff School Division #1509, built 1926. Teacherage at Cork Cliff School. This memorial is dedicated to the memory of the pioneer men and women of the Winnipegosis Farm Church District. We pay tribute to their faith and devotion to this church where they gathered to gain strength and courage. These pioneers brought with them the foresight and fortitude to retain their heritage, culture, and family traditions. Let us always remember the hardships endured and sacrifices made as they struggled and laid a foundation for future generations. The author would like to extend her thanks to Pearl Slobodzian, Joan Namaka, Audrey Erickson, Edna Medd and Duck Mountain School Division #34 for their assistance in obtaining information for this article. Special thanks to Dr. George Fuller at the University of Manitoba for all his guidance and advice. 1. David Butterfield and Edward Ledohowski, Architectural Heritage: The Eastern Interlake Planning District. (Department of Culture, Heritage and Recreation, Historic Resources Branch, Province of Manitoba, 1983), 5571. 2. Basil Rotoff, Basil, Roman Yereniuk and Stella Hryniuk, Monuments to Faith: Ukrainian Churches in Manitoba. (Winnipeg: University of Manitoba Press, 1990), 139. Butterfield, David K. and Edward M. Ledohowski. Architectural Heritage: The Eastern Interlake Planning District, Department of Culture, Heritage and Recreation, Historic Resources Branch, Province of Manitoba, 1983. Butterfield, David K. and Edward M. Ledohowski. Architectural Heritage: The Brandon and Area Planning District, Department of Culture, Heritage and Recreation, Historic Resources Branch, Province of Manitoba, 1983. Butterfield, David K. and Edward M. Ledohowski, Architectural Heritage: The MSTW Planning District, Department of Culture, Heritage and Recreation, Historic Resources Branch, Province of Manitoba, 1984. Erickson, Audrey, The Little Farm Church (Slide Presentation), the author, 1983. Hainstock, Bob, Barns of Western Canada: An Illustrated Century. Braemar Books Ltd., 1985. Reflections From Little Muddy Water: A History of Winnipegosis, Winnipegosis History Book Committee, 1990. 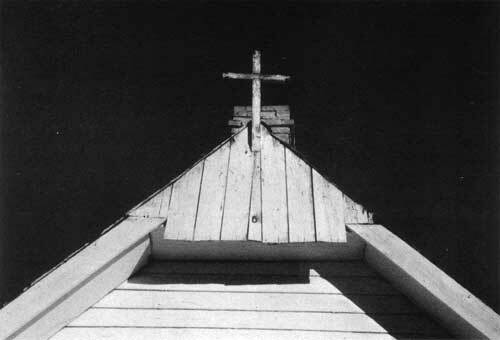 Rotoff, Basil, Roman Yereniuk and Stella Hryniuk, Monuments to Faith: Ukrainian Churches in Manitoba, Winnipeg, University of Manitoba Press, 1990.